Robert Pollard simply can't be stopped. Indeed, the ever-prolific bard is in the midst of one of the most creative and hyperactive periods of his career. Since the summer of 2008, he has released an astonishing ten (10!) 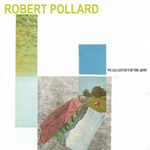 varied and terrific albums with his bands Boston Spaceships, Circus Devils, Cosmos, and as Robert Pollard. Retired from the road, two years deep with his own Guided By Voices Inc. label, the man has the artistic freedom to record what he wants, whenever he wants. What's particularly remarkable is the high quality of his output. With We All Got Out of the Army, Pollard delivers yet again. The new album blasts out of the speakers with "Silk Rotor," a power-pop gem with a swirling, fist-pumping chorus. This song alone is worth the album price. For the next 38 minutes, Pollard puts his unique stamp on sludgy, glam psychedelia ("Rice Train"), jubilant, synth-spiked pop ("I'll Take the Cure"), the kind of moody, melodic, perfectly weird rock 'n' roll long beloved by Guided By Voices fans ("I Can See," "Poet Bums"), and concludes with a haunting acoustic / electric ode with shades of Bowie circa Hunky Dory ("Faster to Babylon"). Trusted producer / collaborator Todd Tobias provided the instrumentation and shared guitar duties with Pollard, who uncorked several guitar leads -- a rare treat, from a man who never showed off his six-string skills on stage. We All Got Out Of The Army was recorded at Tobias' brand new studio in suburban Cleveland, Ohio.